Frigga is a fictional character appearing in American comic books published by Marvel Comics. The character appears in particular in those featuring the superhero Thor, who is Frigga's stepson. Based on Frigg of Norse mythology, she was created by writers Stan Lee and Robert Bernstein and artist Joe Sinnott, and first appeared in Journey into Mystery #92 (May 1963). Frigga is played by Rene Russo in the live-action films Thor and Thor: The Dark World set in the Marvel Cinematic Universe. Frigga first appeared in Journey into Mystery #92 (May 1963), and was adapted from mythology by Stan Lee, Robert Bernstein and Joe Sinnott. The character subsequently appeared in Thor Annual #10 (1982), Thor #344 (June 1984), Marvel Graphic Novel #15 - The Raven Banner (1985), Journey Into Mystery #504-505 (December 1996-January 1997), #512-513 (September–October 1997), Thor #26 (August 2000), Loki #3 (January 2004), and Thor: Son of Asgard #7&9 (August 2004-October 2004) . 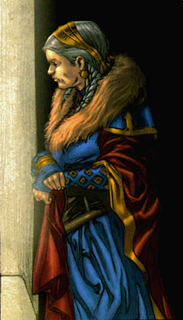 Frigga appeared as part of the "Asgardians" entry in the Official Handbook of the Marvel Universe Deluxe Edition #1. In addition, Frigga had supervised the location and training of the apprentices to the Celestials, the Young Gods. [volume & issue needed] Because of the events of Ragnarok, Frigga is believed to have suffered the same fate as the rest of the Asgardians. After Thor recreates Asgard and restores the Asgardians following Ragnarok, it is revealed that she is actually the mother of Balder. Rene Russo as Frigga in the Marvel Studios film, Thor. Frigga appears in The Super Hero Squad Show episode "Lo! How the Mighty Have Abdicated," voiced by Grey DeLisle. Frigga is played by Rene Russo in the 2011 live-action film Thor. Here she is portrayed as Thor's biological mother. Russo reprises her role in Thor: The Dark World. Since Loki's imprisonment, Frigga has been showing sympathy for Loki by trying to make his incarceration hospitable. During the Dark Elves' raid on Asgard, Frigga is killed by Algrim while protecting Jane Foster, and is later given a Viking funeral. Frigga appears in a four episode motion comic titled Thor & Loki: Blood Brothers, based on the graphic novel, Loki by Robert Rodi and Esad Ribic. She is voiced by Deborah Jane McKinley. ^ Frigga is not specifically depicted during the battle in the comic. It is stated in the comic that the "Asgardians embraced a singular, inevitable death"
^ Graser, Marc (2009-12-16). "Rene Russo joins cast of 'Thor'". Variety. Retrieved 2009-12-17. ^ "Thor & Loki: Blood Brothers Premieres March 28". marvel.com. 2011-03-11. Retrieved 2011-03-11. This page was last edited on 9 February 2019, at 04:53 (UTC).